Last week, Uber expanded its service in Toronto with the launch of uberHOP, a $5 flat fare service along fixed routes in the city. Today, a report by InideToronto is claiming that residents in the Fort York and Liberty Village area are already loving Uber’s new carpooling service. “It’s been amazing,” said Fort York resident Kerrie Atkins. “I’ve taken it all last week, to and from work, and they’ve all been good experiences”, he added. UberHop runs specifically during peak rush hour times to and from the Financial District from 7 a.m. to 10 a.m. and 4:30 p.m. to 7:30 p.m. Users can request a car 10 minutes before their departure time and are given a meeting spot. If passengers don’t arrive on time, the car will leave as scheduled. The service debuted in Toronto last week with plenty of fanfare as it offered the service for free along with some perks including free coffee and a gift bag. The service takes residents from four nearby areas, which also include City Place and the Distillery District in addition to Liberty Village and Fort York. 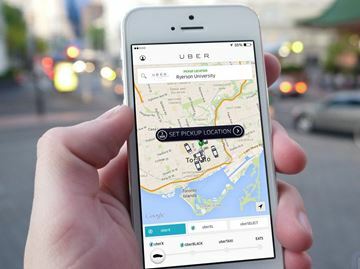 The concept of UberHop however isn’t new to some Liberty Village residents, who were familiar with Line Six, a chartered bus service which served as a transit alternative in the area but was shut down due to legal issues involving the City of Toronto.